A spacious Central West End bachelor pad gets a level of polish proportionate to its industrial-chic vibe. 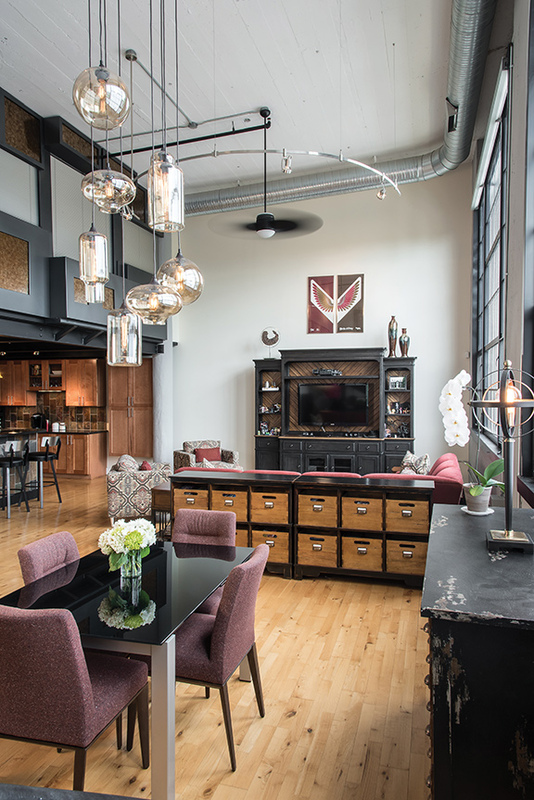 When Kevin Berges moved into his 2,500-square-foot loft a couple of years ago, he knew he’d want to update the space and make it his own. He was equally certain that the apartment, located in the Central West End in a 100-plus-year-old former pharmaceutical warehouse, needed to retain its unique metropolitan charm. “My only real requirement was darker colors,” says Berges. 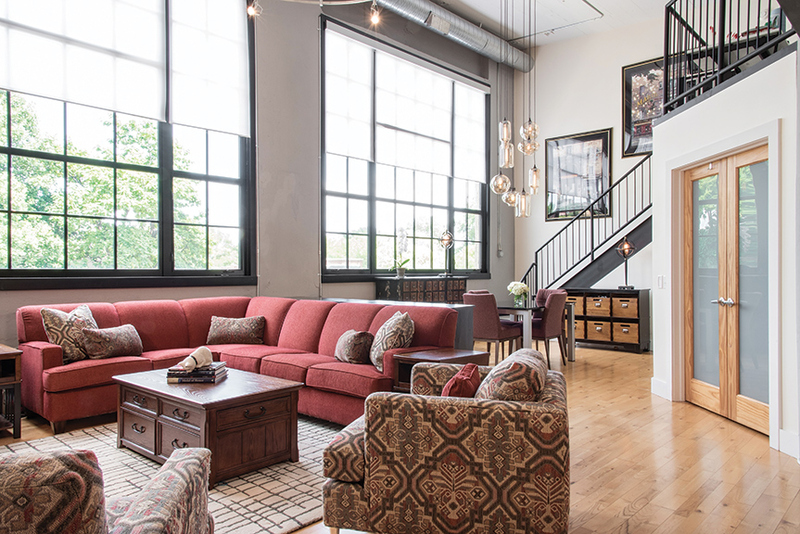 “It’s an industrial building, so I wanted that kind of feel.” Word of mouth put him in contact with interior designer Nancy Barrett of Beautiful Rooms, who worked with Berges to integrate the design with existing furnishings and introduce elements that would make the space more attractive and functional. It’s in the roughly 900-square-foot open living room and dining area where that vibe really shines. “There are lots of windows, so the industrial look was the perfect approach for the space,” Barrett says. The trick to making the natural light work for Berges was finding functional shades that fit three approximately 12-by-11-foot windows. Barrett replaced three motorized shades on each window with a single automatic shade. Berges has them programmed to open and close at certain times for maximum light or privacy. And, when he wants to go off the program, he can operate them from a smartphone app. Berges had brought with him a brick-red sectional that now anchors a color scheme that’s lush with warm neutrals and wood, and also serves to divide the living room from the dining area in an otherwise wide open space. Suspended above the table is a eight-light fixture befitting of the generously sized room. It’s a far cry from the two glass pendants that hung there before, getting swallowed up by the high ceilings and open floor plan. “It felt too skimpy for the space, which is two-plus stories,” says Barrett, who had the area rewired to accommodate the extra lighting. The payoff is a warmer glow from lighting that’s scaled to its environment. In fact, everything about Kevin Berges’ living/dining area is warmer, even while staying true to its industrial roots.